Zephyr Cove-Round Hill Village, NV….The new management of Round Hill Pines Resort and Marina, a Lake Tahoe summer retreat for more than 60 years, see the next 30 years of the resort filled with opportunity to build on the success of the beloved family beach. With a proven track record operating businesses and year-round resorts in Tahoe, the new management company owned by Bob and Tammy Hassett, will be working with the U.S. Forest Service this winter to prioritize improvement projects that will include new food and beverage facilities, environmental upgrades, improved parking, restrooms, and finalizing an operational plan for the upcoming summer season. As longtime active community members, the Hassetts are supporters of numerous Tahoe charities and organizations including the South Lake Tahoe Fire Department, Lake Tahoe Community College and the Tahoe Fund. Tammy moved to South Lake Tahoe as a young child and graduated from South Tahoe High School. Bob, a native of New Jersey, moved to the area in 1983. He started Action Watersports of Tahoe in 1988. 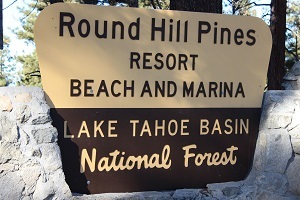 Round Hill Pines opened as a privately owned summer only resort in 1951. 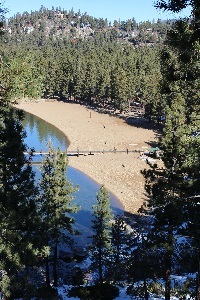 The U.S. Forest Service purchased the land in 1984. During the bid process, which opened December 2012, the U.S. Forest Service encouraged applicants to propose their own unique vision for short-term public overnight accommodations and winter offerings at the resort. The prospectus also listed required facility improvements and asked for plans for the historic cabin and lodge structures that exist within the site boundaries on a bluff overlooking Lake Tahoe. The Hassetts said next summer’s operations will most likely remain similar to previous years, while the proposals for improvements start through the National Environmental Policy Act (NEPA) analysis process. Because some structures are eligible for the Historic Register, portions of the improvement plans will also require evaluation by the Nevada State Historic Preservation Office. The Hassetts anticipate employment levels at the resort for next summer to remain consistent with prior years, with increased staffing as improvements are added. Operations at the administrative level will utilize existing resources at Round Hill Pines sister resort, Camp Richardson Historic Resort & Marina. A web site launch is planned for January. Media contact Christina Proctor, Christina@weidingerpr.com or Phil Weidinger 775-588-2412.